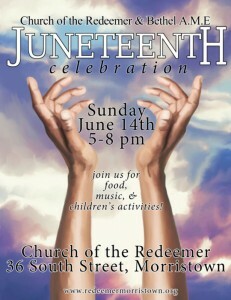 Join us on June 14th!! Juneteenth, our party with Bethel A.M.E. (and for the community) that commemorates the emancipation of African-American slaves throughout the Confederate South, will be observed on Sunday, June 14, from 5-8p. Ed Alstrom, musician extraordinaire will be here to supply the spirit and Ms Betty and her crew will bring incredibly good food. Sensei Ray Cicetti of The Empty Bowl Zen Community and the Rev. Cynthia Black of Church of the Redeemer will lead members of the community in a brief meditation and raising of prayer flags on Tuesday, May 12, 2015, at 6:15 p.m. to call attention to the plight of the people of Nepal following the devastating April 25th earthquake. And there were a few other little changes in Saturday’s Catholic Mass in Morristown. Joseph “Joe” Leidy, a former Morristown councilman and planning board member who was involved in the Headquarters Plaza project, will be remembered by friends and family at a service on Saturday, March 7, 2015, at the Episcopal Church of the Redeemer. Temple B’nai Or in Morristown celebrated its 60th anniversary with a parade that began exactly where the community began in 1954 — at the Church of the Redeemer. Summer Hours at Redeemer and S6! We’re beginning summer hours this Sunday, June 15. It will be our honor to have Bishop Beckwith with us this weekend as we kick off RedeemerFest. We invited him to be present as we “take Redeemer to the streets” and he said yes! He will be with us for the Super Speedy Summer Sunday Service and Supper on Sunday, June 8th. Please join us to welcome the bishop and show him some of our radical hospitality!